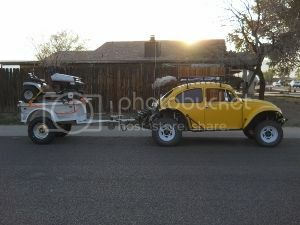 AzBaja.com, Home of the VW Baja Bug -:- Baja Forums -:- AzBaja.com Members -:- Projects and Builds -:- Lets talk tires. Baja Forums -:- AzBaja.com Members -:- Projects and Builds -:- Lets talk tires. Post subject: Lets talk tires. Just starting on my 68 Baja Beetle revival project. I have a really cool old vw mechanic helping me put together the drive train. This weekend i'm shopping for tires, I've 15 inch rims. 5 inch wide wheels for the front and 9 in wide wheels on the rear. I'm looking for 32x11.5 for the rear and anything on the front thats narrow and tall, but also i need really soft tires with soft sidewalls. Everything I've found that I think will work, like BF Goodrich and Mickey Thompsons, I'm being told are too hard of a tire. Anyone have any specific suggestions? 31x10.5 is the most common tire used on baja's anything bigger might hit your torsion tubes if you have long torsion bars. Clearance isn't going to be an issue on what we're building. I was more wondering what matching set of tires I could get that would look good and handle well. I went with the bf goodrich and they look fantastic. But I'm second guessing putting knobby tires on the front axle. We'll see. If it handles like a snow plow I'll know I made the wrong choice. most tall tires in the fount will rub with a stock beam... what are you going to use the car for??? daily driver? Weekend trail rider? once you decide what you are going to use the car for then decide on tires. What type of tires are you looking for? Post subject: Re: Lets talk tires. You're looking at bigger tires than what I'm running on my '61 swingaxle/stock beam but here's my 2 cents. I picked up a set of Method wheels from Summit in 4"x15" front and 7"x15" rears. They are now wearing Mickey Thompson Mini Mag tires, 6.50x15, roughly 29" tall. Rears have Super Swampers in 8 50x15, 28.50" tall. Swampers are fantastic here in the desert and are surprisingly comfortable driving around town. My daily driver is a lifted '81 Land Cruiser with BFG Mud Terrains so they feel similar. Happy trails! Projects and Builds I am looking for some tires.